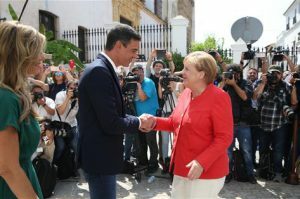 The agreement came as Spain’s new Socialist Prime Minister Pedro Sánchez met with German Chancellor Angela Merkel for a working lunch on Saturday. It was part of a two-day visit by the Chancellor for talks with the Prime Minister. The meeting took place at Guzmanes Palace in Sanlucar de Barrameda, southern Andalusia. They were joined by Begona Gomez, wife of Sánchez, and Joachim Sauer, husband of Merkel. Faced with a crackdown by Libyan authorities and Italy‘s hardline approach to immigration, Spain has now become the main destination for people trying to get to Europe from Africa. Sánchez said he and Merkel agreed to ‘intensify dialogue and cooperation with countries of origin and transit’ of migrants, mainly Morocco. Saturday’s meeting in the southern Andalusia region coincided with the entry into force of a deal under which Madrid pledged to take back migrants in Germany who had already been registered in Spain. It is one of a series of bilateral agreements that Germany is seeking with EU partners, with Merkel under pressure to reduce the number of migrant arrivals to her country.